Dear traveler, if you want to relax, enjoy with your family and friends, surround yourself with nature, know Cordoba, Seville, Andalusia, if you are on vacation, business, some event, work meetings, family or any other type, we assure you that is on the right page, read carefully what we offer and check our website by clicking on the corresponding tab. 10 km. of Villaviciosa de Córdoba in the property called, the time to travel the journey to the house with a normal car is between 15 and 20 minutes, runs for 3 km of asphalt road, 4 of gravel forest track and 3 of earth lane. At the end you will find yourself in an isolated house in the Sierra Morena. La Campana, in the heart of Sierra Morena is the rural house La Molina de la Campana. It is an old oil mill house, centenary, restored that incorporates in the 70 m2 living room the old machines, in the center is the stone separating the kitchen from the dining room and next to the bedrooms is the press converted into a fireplace. Both machines that once served to extract the oil from the olives, today without losing their identity contribute with originality to create a warm home and miller atmosphere. In La Molina de la Campana, near the Natural Park of Hornachuelos you can relax, walking through the Sierra, listening to the bellowing of the deer, doing ornithological tourism, hunting, staying when you go hunting in the Paraiso cinegetico de Villaviciosa. It is an isolated house restored from centuries-old ruins of what was once a small mountain farmhouse. It consists of three large double bedrooms, one adapted for the disabled, a bathroom adapted for the disabled. The living room with fireplace is shared with the kitchen. A paved patio where an exhibition of the old oil extraction machines is located. All rooms are equipped with central heating, fireplace, television with DVD, the kitchen is equipped with refrigerator, microwave, washing machine, blender, barbecue, kitchen with oven and all kitchen utensils, crockery and linen such as sheets, towels and table linen with weekly change. Comfortably furnished inside and outside. 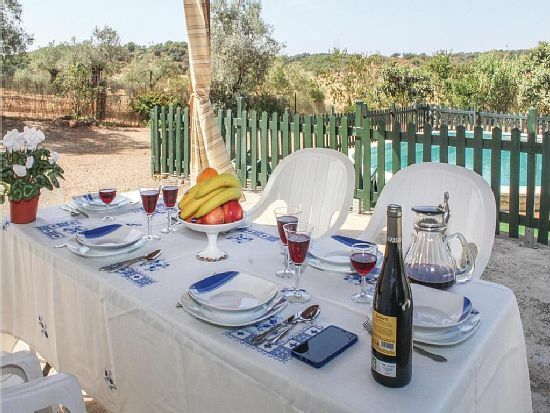 The property is part of the so-called Cortijo de la CampanaOutdoor, among old olive trees, is the pool with privileged views of valleys and mountains of Sierra Morena, equipped with sewage treatment plant and a barbecue. It is an old oil mill house, centenary, restored that incorporates in the 70 m2 living room the old machines, in the center is the stone separating the kitchen from the dining room and next to the bedrooms is the press converted into a fireplace. Both machines that once served to extract the oil from the olives, today without losing their identity contribute with originality to create a warm home and miller atmosphere. In La Molina de la Campana, near the Natural Park of Hornachuelos you can relax, walking through the Sierra, listening to the bellowing of the deer, doing ornithological tourism, hunting, staying when you go hunting in the Paraiso cinegetico de Villaviciosa. My husband and I spent a wonderful two weeks at Molina. It was very easy to find driving from Seville airport via Cordoba. Manuel, the owner is a fantastic host. The house is in a quiet and remote setting about 9km outside the village, 3km are along a rough track. If you are looking for a private, quiet setting surrounded by nature but with modern comforts this is the place. From the house you have a panoramic view of uninterrupted olive groves and pine forests covering the surrounding hills. Wild flowers, herbs and fruit trees make up the immediate garden which also has a good sized pool. Half a km below the house is a small farm with a few friendly dogs and horses which roam freely in the neighbouring fields. Birdsong fills the air from dawn to dusk and we enjoyed having a glass of wine in the garden most evenings watching the sun set over the hill. The house has three bedrooms and a huge open plan lounge/dining kitchen. Three big sofas, so plenty of room to relax and the kitchen is well equipped with pans, crockery, glassware, cutlery, cooking utensils etc. Good sized fridge freezer and gas cooker, washing machine and microwave, no kettle but they do have a cafetiere as you'd expect for the region. The quality of the furnishings is home standard as opposed to the cheap cast offs which other places we have stayed at tend to use so comfort is not an issue. We found the beds varied from hard to soft so all needs were catered for and the shower room is well equipped with a good power shower and even a bidet if required. Tiled floors throughout, mosquito nets fitted to all the windows along with wooden shutters, real open fireplace, lots of character, we will certainly be returning. Villavicosia has an abundance of food shopping options, bars and local produce wholesalers for jambon, wine and olive oil. Molina is clean, peaceful and secure - perfect for couples, families and friends who prefer quality self catering in real surroundings. Sin estres, sin prisas, sin ataduras horarias, solos en medio de la naturaleza en su estado mas puro. Hemos pasado una semana con total relajación, es una cura de sueño. Te dedicas a pasear y ver ciervos, a leer, a bañarte despues del paseo para quitarte el calor. Simplemente paz y tranquilidad algo a lo que no estamos acostumbrados. La casa perfecta en limpieza y con todo lo necesario para vivir. Manuel su dueño siempre atento a todo y tambien su esposa. Nos fuimos con pena porque mi perrita Wendy se hizo amiga de una gatita negra que nos visitaba todos los dias, es super cariñosa y vive del turismo, espero que los demas clientes la traten con cariño. Te encuentras tan agusto que no tienes ganas de ir a ningún sitio, por eso hay que comprar el primer dia para no moverse del lugar. LA ESTANCIA CÓMODA, AMPLIA Y LIMPIA, EN EL CORAZÓN DE SIERRA MORENA, HACEN LA COMBINACIÓN PERFECTA PARA QUE TODO SALGA A PEDIR DE BOCA. PUDIMOS SENTIR LA FUERZA Y LA BELLEZA DE LA NATURALEZA, EN VARIOS PASEOS Y UNA RUTA HACIA UN RIACHUELO EN UN PARAJE CASI VIRGEN. MUY BONITO E INTERESANTE. VIMOS LA FAUNA Y LA FLORA DE LA ZONA, CASAS DE CAMPO AISLADAS, RUINAS DE ALGUNOS CORTIJOS VIEJOS ABANDONADOS, VISTAS DESDE LO ALTO DE UN MONTE A UN VALLE CON DOS O TRES CASAS DESPERDIGADAS, PRECIOSO. PASAMOS JUNTO AL CORREDOR DEL LINCE IBÉRICO DESDE DOÑANA A MONTORO-CARDEÑA. NOS CANSAMOS Y DESCANSAMOS COMO NIÑOS CHICOS, COMIMOS OLLA, BARBACOA, ENSALADAS Y ENSALADILLAS, PESCADO EN LA PLANCHA, Y PARA TERMINAR DE IDENTIFICARNOS CON EL TERRENO, JABALÍ EN SALSA. TODO ESTO LO PONGO PARA QUE SE OBSERVE QUE LA CASA ESTÁ BIEN DOTADA DE UTENSILIOS PARA LA COCINA. A QUIEN LE GUSTE UN TOQUE DE AVENTURA, PUEDE PERDERSE EN LA SIERRA, CONTARÁ CON LA AYUDA, AMABILIDAD Y BUENAS MANERAS DE MANUEL Y SU ESPOSA, NO TE TRATAN COMO CLIENTE SINO COMO ANFITRIONES PERFECTOS DE UNA FAMILIA DE SEIS PERSONAS. GRACIAS. VOLVEREMOS EN TIEMPO DE PROBAR LA SENCILLA PERO COQUETA PISCINA. Preciosa casa en medio de la naturaleza. Estuvimos muy muy a gusto tanto en la estancia como paseando por los bellísimos alrededores. We verbleven met 4 personen gedurende 15 dagen in La Molina. De vakantiewoning is ingericht in een oude olijfoliemolen en is ook omringd door duizenden olijfbomen. Het huis is ruim genoeg voor 6 personen, al speelt het dagelijkse leven zich toch vooral buiten en rond het zwembad af. Dit zwembad was goed verzorgd en is geen overbodige luxe bij temperaturen die weleens durven oplopen. Het dichtstbijzijnde stadje Villaviciosa, met een kleine supermarkt, wat cafés en een (vrij goed) restaurant, is op een kwartiertje rijden over een onverharde weg die over een afstand van 1 km in de buurt van het huis wel wat opknapwerk kan gebruiken. Maar ook met een gewone personenwagen vormt dit geen probleem en het draagt zelfs bij aan het gevoel van rust. Verder grenst het domein aan een mooi natuurgebied, kan men wandelingen of mountainbiketochtjes maken in de nabije omgeving, en is er natuurlijk met de stad Córdoba één van de mooiste steden van Spanje in de buurt. We werden er hartelijk ontvangen door onze gastheer Manuel en zijn vrouw, die ook regelmatig kwamen kijken of alles naar wens was. Voor ons alleszins een meevaller! Hemos estado el puente de mayo en La Molina. El entorno es espectacular. Estás en un cortijo andaluz, muy cómodo, cerca de un pueblo con todo lo necesario (y un retaurante espectacular con un trato muy bueno, Sierra Morena, a la entrada del pueblo). El paisaje por la carretera desde Córdoba ya te va introduciendo en los paisajes de la serranía. Y cuando llegas al cortijo, te sientes en plena naturaleza, el entorno es fantástico. Ciervos, muflones, jabalíes nada más salir de la casa y unos paisajes de Sierra Morena espectaculares. El trato de Manolo, el propietario, muy cordial y atento a todo lo que necesites. Para repetir sin duda. https: // www. Youtube. com / watch?